Of Agreements & their interpretation. Reading a government document nearly always is a painful exercise in deconstructing & decoding the official lingo. Aim of official communiqué more often is to conceal & control information rather than share & educate. A letter to the IAEA board of governors sent by Pakistan government is a study in remarkable contrast. Plainly & simply worded it cogently argues its case against approving India specific safeguards agreement. Main burden of its argument is “What is the big rush?” to clear this agreement while flouting IAEA’s own mandate of a cooling period of 45days. A period so set aside for member states to coolly deliberate over ramifications of proposals that do not conform with established policy or model draft agreements. Canada, France & Russia will endorse the India specific proposal as they would be keen to engage in the huge nuclear reactors market thus opening up. Japan has been obdurate in opposing nuclear proliferation. Australia & Germany are little less uncompromising, but equally unfavourable to non-signatories of NPT or CTBT. However, USA overwhelms dissent so conclusively at UN forums that IAEA board of governors is most likely to endorse India specific safeguards agreement unchanged. Even China will have to fall in line. What stands out here is that US administration can do pretty much what it wants with international treaties, conventions or agreements. If majority is not available at a UN body, it can be coerced. If coercion fails, then USA says to hell with UN majority. Much has been said for & against the Indo-USA peaceful nuclear cooperation agreement. Without weighing in on the pros & cons here, one point may safely be made here for careful reflection. Opponents have sighted Hyde Act provisions to highlight the dangers for India. Proponents have maintained that ‘123 agreement’ is a standalone understanding & India has nothing to do with US legislation. So here we find contentious positions on interpreting the agreement & its context. Today Pakistan feels like an aggrieved party. Tomorrow, 123 agreement comes into force & an occasion arises for India to explode a nuclear device. Something India is entitled to do, the proponents hold, as a possessor of advance nuclear technology (ANT).According to proponents the reference to ANT is a tacit admission by USA, and may be by implication the whole world, that India is a Nuclear Weapons State (NSW) – a term unequivocally referring to 5 permanent members of the UN Security Council. A tacit agreement is a grey area, anyone would readily admit. If upon such nuclear test the US administration were to hold India in breach of 123 agreement, IAEA safeguards agreement & the understanding with nuclear suppliers group (NSG), whose interpretation is likely to carry the day? India’s or USA’s? Who else will or can come to India’s aid in such a situation? If past is any guide to future behaviour, then the successive US administrations that have been addicted to war do not inspire any confidence. Nor do the capitulation of rest of the world including that of India. While on the Pakistan’s letter to IAEA, Indian express does not leave a single opportunity to malign the opponents of the deal using cleverly poisoned news headlines as a weapon of first resort. Sample this : ‘At IAEA, Karat, Advani have an unusual ally: Islamabad…’ It is a stealth missile that has multiple targets. Karat, Advani are made out to have colluded with Pakistan, almost accusing them of treason. Mentioning them together also causes discomfiture to their respective mass constituencies & also portrays them as rank opportunists who have come together forgetting their deep ideological differences only to oppose Congress. I end with a very educative graphic from Stockholm International Peace Research Institute on merchants of death. While 5 leading merchants account for 79% of world large conventional weapons export, USA & Russia account for more than 55%. Some curious facts emerge worth mentioning concerning imports of large weapons by tiny countries sometimes with no apparent danger of imminent conflict. 1. 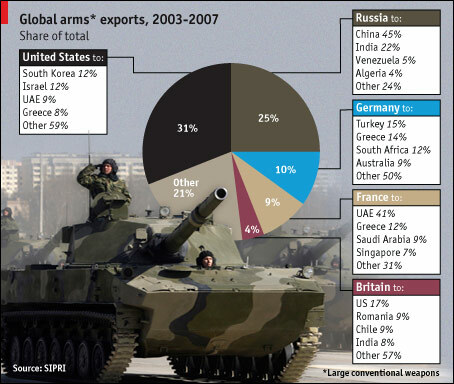 Greece imports 8%, 14% & 12% of US, German & French exports constituting almost 4% of global exports of large weapons. 2. Greece has been in conflict only with Turkey over Cyprus of late. Yet they both are Germany’s largest customers. 3. Similarly UAE & Israel at 5% & 3% imports of total world exports buy significant quantities. Israel gets & creates regular opportunities to test weapons & deplete its stocks in conflicts with Palestine & Lebanon. UAE, who has not had a known conflict, probably was made to buy so large quantities for use of US troops in Iraq, and now possibly Iran. 4. Russia, who is perceived as great friend of India, does doubly brisk business with China, a country seen as a formidable competitor & an intractable foe. Merchants always make profits, preying even on death & destruction, though in the name of freedom & liberty.